While Dr. Stuttgen gets fantastic results for his patients, he recalls one success story that stands out. A 7-year-old boy had a significant hearing deficit. When his parents would walk in the house, the TV would be blaring, and nobody could hear each other. The child also had multiple ear infections and tubes in his ears. The boy still had hearing problems until he was brought in to see Dr. Stuttgen for care. After the child received care, the audiologist confirmed he had 100% hearing in both ears. The boy is on a wellness program at Align Wellness Center and just had an appointment with his audiologist. His hearing is still at 100%! One of the ways the practice is different from others is that Dr. Stuttgen is highly efficient. Routine office visits take only a minute or two, and yet his patients experience positive outcomes. He stays abreast of the latest in the field by attending seminars, reading journal articles, watching chiropractic technique videos and more. He’s always trying to learn new things so he can offer his patients the best in care. 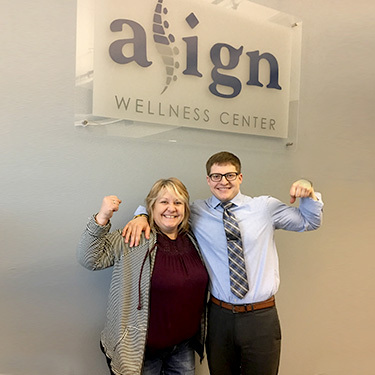 If you’ve been searching for a chiropractic office in Wausau that offers the finest natural care, contact us today to schedule a same-day appointment!